Near end of the work day yesterday my eight year old son and six year old daughter got off the bus and came to visit me in my office. They wanted to check out all the bird nests on the walk home. I boosted Kyle and Anne up on my shoulders to peer into the nests. We found several finch nests with small white, barely speckled eggs, and even one finch nest with light blue eggs. Two of the nests had larger white eggs, but heavily speckled with brown. Instantly I remembered what I had read about Brown-headed Cowbirds and their parasitic nesting practices. I just had never seen it for myself until then. The Brown-headed Cowbird is a stocky blackbird with a fascinating approach to raising its young. Females forgo building nests and instead put all their energy into producing eggs, sometimes more than three dozen a summer. These they lay in the nests of other birds, abandoning their young to foster parents, usually at the expense of at least some of the host’s own chicks. 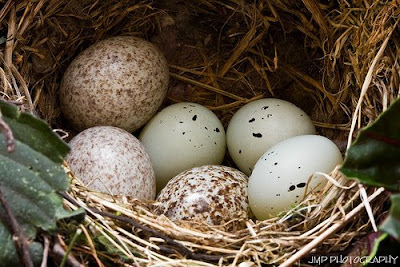 Brown-headed Cowbirds lay eggs in the nests of more than 220 species of birds. Recent genetic analyses have shown that most individual females specialize on one particular host species. Cowbird eggs hatch faster than other species eggs, giving cowbird nestlings a head start in getting food from the foster parents. Young cowbirds also develop at a faster pace than their nest mates, and they sometimes toss out eggs and young nestlings or smother them in the bottom of the nest. I remember in our Arizona backyard we had a large flock of House Sparrows feeding at our seed block every day, but there was always one young male Brown-headed Cowbird hanging out with them. The poor guy was probably raised by House Sparrows and thought he was one. The story of the Ugly Duckling was a reality to him. Because of the parasitic nature of Cowbirds I have come to discover that many birders despise them and blame them for the decline of other species. While that may be true, I am simply fascinated by the mode of survival that they have developed.